Black Mare are a solo project from Los Angeles, California that plays an ethereal mixture of atmospheric rock, darkwave and goth and this is a review of her 2017 album "Death Magick Woman" which will be released in September by Magic Bullet Records. Clean playing along with some drones start off the album as well as some drum beats a few seconds later while all of the musical instruments have a very powerful sound to them and the music also brings in a great amount of darkwave and post rock elements and the vocals also give the songs more of an ethereal and goth style. Some of the tracks are long and epic in length while some goth rock and death rock influences from the 80's and 90's are also used at times but done in a more modern fashion along with some male vocals also being utilized briefly and on some of the tracks the guitars get more distorted and when guitar leads are utilized they are done in a very melodic style and a touch of black metal can also be heard on the closing track. 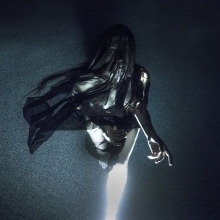 Black Mare plays a musical style that takes atmospheric rock, darkwave and goth rock and mixes them together to create a sound of her own, the production sounds very professional while the lyrics cover hidden realms, fragments of dreams, submerged memories and mythological imagery themes. In my opinion Black Mare are a very great sounding mixture of atmospheric rock, ethereal, darkwave and goth and if you are a fan of those musical genres, you should check out this solo project. RECOMMENDED TRACKS INCLUDE "Ingress To Form" "Coral Vaults" and "Inveted Tower". 8 out of 10.